Namaste: The Whole Story: Peace comes from within. Death comes from without. Amit is a member of the order of shadow monks, his every waking moment is spent training his body and mind to the peak of human ability - and beyond. But the order is pacifist, a repository for deadly weapons with their safeties permanently set to "on". Until everything is taken from him, and Amit decides that turning the other cheek is no longer an option. Now, every ounce of his training will be put to the test. His epic quest for revenge will see wrongs righted - or see Amit forgotten in an unmarked grave. Namaste includes "Prelude", as well as the rest of the adventure. Join Amit as he chases Nisha's killer from boss to boss, all the way to the last place he ever expected. He will fight, and die if he must. What will be, will be. It's a Zen thing. If you enjoy action, violence and Asian style combat, with a hint of buddist/monk enlightenment: you'll really enjoy this book! Well written with great narration, just not my cup of tea. What did you love best about Namaste: The Whole Story? A truly mind-searching story. When someone says to you "THEY SAY....." do you ask "who are THEY?" And when someone says "IT IS WRITTEN" do you ask "but WHO wrote it?" And who is to say what THEY have WRITTEN is really the answer? No? Then maybe you should. What held my attention was the descriptions of each of the body guards while they were waiting for someone to make the first move. The ending was surpurb. Just as it should have been. Yes. The bank scene when he is told he's dressed like a pimp and he was surprised. I was touched and amused by his bewilderment. Exceptional writers and comforting narration. Thanks to all who made this story memorable. I Absolutely LOVED This Story! Okay, so I'm a HUGE fan of Sean and Johnny's work, but for some reason Namaste wasn't on my radar of "Need to reads." Even so, I had some traveling to do and figured I'd give Namaste a shot during the flight, if it grabbed me I'd keep reading. Holy crap, it grabbed me alright...by the throat! This was the perfect book to get lost in. Actually it was more like being pulled behind a speeding truck on a skateboard, there was no way I was letting go until the last page. Namaste was brutal, cunning, thoughtful, and 100% AWESOME! The narrator did an excellent job of bringing the story to life. 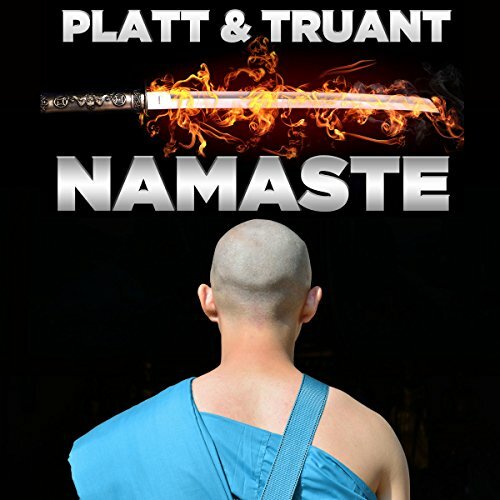 You can't miss this great book by Platt and Truant ! The performance of the voices by the read is outstanding! there are many things to learn if one is willing to listen and here, one all ways knows the answer before the question is spoken. No. It was exaggerated, dis-jointed and only marginally performed. Didn't get that far. Totally lost interest about half way through. Very mechanical performance, voices unrealistic, just read not performed. Was Namaste: The Whole Story worth the listening time? Exciting with surprising twists and turns. narrated well. I really enjoyed listening to this book.